BY MASS MUTUAL Feeling stressed? Want just two minutes for yourself? Want to pull the blanket over your head? Not answer the phone? Lose yourself in a good book? You’re no different from others who feel stressed. But while these actions might give you a moment of escape, there’s no long-term relief. Stressors in your life are still there, waiting for you. What might you do instead? For individuals or families with special needs, managing stress can feel insurmountable, which is why building a network of people to rely on is critical to helping you gain control and reduce stress. Getting to know other families facing similar challenges can provide friendship and support and may lead you to products, services, organizations, and other individuals and experts who can help. • A Special Care Planner or financial professional who’s skilled in helping individuals and families with special needs. • A special needs attorney who knows how to structure special needs trusts and estate plans, has a comprehensive knowledge of laws affecting people with special needs, and is abreast of changes in legislation. • A family or tax attorney to handle other legal aspects and work with your special needs attorney to ensure your legal strategies don’t conflict (for example, ensuring a family trust doesn’t contradict a special needs trust’s intent). • Social security representatives and other social workers who can answer your questions about benefits and services, directing you to those you may need. • An advocate who can help you get the best education for your child through your school system’s special education department. • Your medical providers and therapists, of course, who provide ongoing care or services as needed. When a member of a family has special needs, it’s important that the person’s caregivers find time to relax. It’s usually the last thing on the list of stress management strategies, but without some down time, the caregivers’ own health could begin to decline, and so could the care being given. “Often times, we see clients who are parents of a child with special needs, and they’ve been pulled in too many directions for too long,” explains McGannon. Here’s where that network of supporters can help. Rely on friends who can step in to manage an ongoing chore or provide an evening of care so you can get that much-needed break. 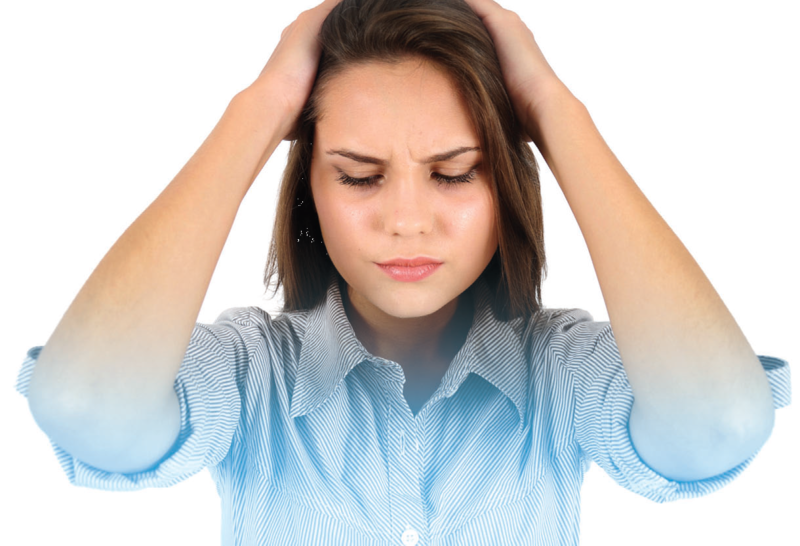 Here are some little triggers that, when occurring again and again, can cause major stress. • Not being able to find something – a specialist’s phone number, medical expense receipts, your child’s latest IEP report that needs your signature, your keys, that grocery list you wrote out last night…the list goes on. • Missing an appointment that wasn’t on the calendar. • Finally finding time to complete that application (for social security benefits, for example) and realizing documents you need are in three different places, including a pile of miscellany waiting to be sorted. • Forgetting a bill that’s lost in clutter. Sound familiar? Managing your appointments, your family activities, your things, your medical and financial records, even your time can greatly minimize stress. So find ways to get and stay organized. • Search for apps to help you create to-do lists and grocery lists, keep one calendar for all family activities, jot reminders to yourself, alert you of upcoming appointments, design the most efficient route for multiple-errand runs. • Designate blocks of time for specific tasks you want to accomplish. • Keep medical information in file folders or another filing system that works best for you. “Our agency also offers clients a Care Book, a binder with tabs for medical records, contacts, resources, medications, calendar of events, emergency preparedness, growth tracking, stress triggers, and more to manage important information regarding the care of the person with special needs,” says McGannon. Once organized, you’re more likely to take care of little things as they occur and conquer big things with more confidence. Local service or disease/disability-related organizations may offer products, services, discounts, information and more. Local, state, and federal governments also offer programs, services, and financial support. Learn what’s available and how the systems work (regulations, eligibility guidelines, who to contact, where and how to apply, application deadlines, waiting periods, etc.). resources. “We’ve built our own network, and experts in our network have built connections of their own,” says McGannon, “so when our clients let us know what they need, we can help them find it.” Also, if the service is available in your region, dial 2-1-13 to learn what’s available. • www.disability.gov – A great go-to website with a wealth of information about disability programs and services available nationwide, including a “guide me” tool and search box to help you find what you need most. • www.dol.gov/whd/fmla — The federal government’s Department of Labor website page explaining the Family Medical Leave Act. • www.ada.gov – Everything you need to know about the Americans with Disabilities Act from the U.S. Department of Justice Civil Rights Division. “We’ve met with clients who think they’ve managed their finances,” says McGannon. “They have savings and retirement accounts, maybe life insurance policies, perhaps a trust, and they plan on working long and hard to set aside money for their child with special needs. A special care planner like McGannon, trained and experienced in financial services for people with special needs, can ask the right questions and help families understand financial options they didn’t know they should consider. The special care planner may also look beyond the family’s finances, asking what the client knows about plans an ex-spouse, grandparent, or other family member might have that might pose problems. For example, an ex-spouse (a parent of the child with special needs) may have named the child as beneficiary of a life insurance policy, but obtaining those funds could make the child ineligible to continue receiving government benefits. “When we learn scenarios such as this, we can help our client explain the repercussions to the ex-spouse and suggest ways their strategies could best serve the needs of their child,” says McGannon. We’ve mentioned some ways you can begin to reduce stress in your life. You can find many more ways, we’re sure. What matters most, though, is that you begin. Start somewhere. Take that one first step to eliminate a stressor in your life. Gain control. Then take more steps. 3 2-1-1 is a national service that provides health and human services information: community services, organizations, volunteer opportunities, employment, affordable housing, support groups, elder services, addiction programs, and more. * The Special Care Planner, a title used by MassMutual financial professionals, who have received advanced training and information in estate and tax planning concepts, special needs trusts, government programs, and the emotional dynamics of working with people with disabilities and other special needs and their families. The certificate program was offered by The American College in Bryn Mawr, PA, exclusively for MassMutual financial professionals. Additionally, a designation of Chartered Special Needs Consultant (ChSNC), which evolved from the certificate program, is now offered through the American College for financial professionals. MassMutual financial professionals who have completed the certificate program, or received the ChSNC designation can use the Special Care Planner title. A Special Care Planner through MassMutual’s SpecialCareSM program can assist parents in drafting Letters of Intent and can help make a difference in the quality of life for an individual with special needs, their caregiver and other family members. Through SpecialCare you will learn valuable financial strategies, identify financial strategy solutions, access vital information, and meet certified specialists who will work with you and your professional advisors – your banker, accountant or financial planner, lawyer, social workers and health care providers – to review your financial picture and offer options to fit the needs of each situation. For more details, visit MassMutual’s website at http://www.MassMutual.com/specialcare, or call 1-(800)-272-2216. Founded in 1851, MassMutual is a leading mutual “http://www.massmutual.com” life insurance company that is run for the benefit of its members and participating policyholders. The company has a long history of “http://www.massmutual.com/aboutmassmutual/ financialinfo/strength” financial strength and strong performance, and although dividends are not guaranteed, MassMutual has paid dividends to eligible participating policyholders consistently since the 1860s. With http://www.massmutual.com/productssolutions/individualsfamilies/producttype/lifeinsurance/wholelife whole life insurance as its foundation, MassMutual provides products to help meet the financial needs of clients, such as “http://www.massmutual.com/productssolutions/individualsfamilies/producttype/lifeinsurance” life insurance, “http://www.massmutual.com/productssolutions/individualsfamilies/producttype/disabilityincome” disability income insurance, “http://www. massmutual.com/productssolutions/individualsfamilies/producttype/longtermcare” long term care insurance, “http://www.massmutual.com/retire/plansponsors” retirement/401(k) plan services, and “http://www.massmutual.com/productssolutions/individualsfamilies/producttype/annuities” annuities. In addition, the company’s strong and growing network of financial professionals helps clients make good financial decisions for the long-term. MassMutual Financial Group is a marketing name for Massachusetts Mutual Life Insurance Company (MassMutual) and its affiliated companies and sales representatives. MassMutual is headquartered in Springfield, Massachusetts and its major affiliates include: Babson Capital Management LLC; Baring Asset Management Limited; Cornerstone Real Estate Advisers LLC; The First Mercantile Trust Company; MassMutual International LLC; MML Investors Services, LLC, Member “http://www.finra.org/” FINRA and http://www.sipc.org/ SIPC; oppenheimerFunds, Inc.; and The MassMutual Trust Company, FSB. The information provided is not written or intended as specific tax or legal advice. MassMutual, its employees and representatives are not authorized to give tax or legal advice. Individuals are encouraged to seek advice from their own tax or legal counsel. Individuals involved in the estate planning process should work with an estate planning team, including their own personal legal or tax counsel. Special Needs Trusts – How Much Trouble Are They To Manage?